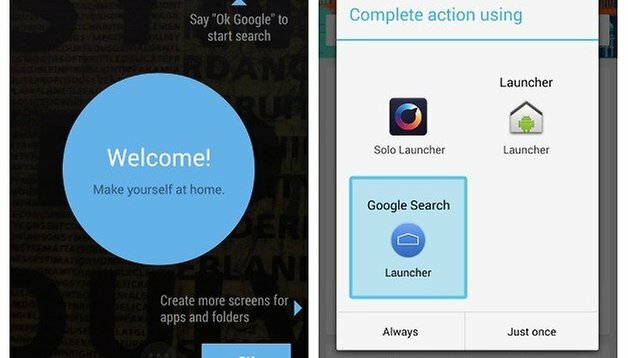 So, you can't wait to install the all new Google Experience Launcher from the Play Store? Well you're in luck because some serious digging work was done overnight and we've got all the components you need to get the juicy new KitKat launcher on your phone right now. Here's how. The Google Experience Launcher, aka Google Search Launcher, gives you voice search capabilities without having to tap a button. Just say ''Ok, Google'' from any home screen and Google will look it up for you. Google Now can now be found as a home screen as well as via the old swipe up gesture. There's other changes to screen management and settings but you can discover those for yourself. It'll all add to the experience. Once you've downloaded the three components, just install them in turn and you should be all set up with the Google Experience Launcher on your device. If your first experience with the Experience Launcher is a force close of the voice search, don't despair, all you need to do is change your default language for search, do a search and then change your voice search settings straight back to your original language. That's it. The force close of voice search will need to be dealt with again every time you reboot your phone (via the same method). If this is too much for you and you have root access on your device, you can complete the following fix pulled from XDA Developers to permanently solve the voice search crash issue. Download the libgoogle_recognizer_ini_I.zip from the XDA link above and extract the ZIP file. Move the ZIP file to /system/lib on your device and the next time you try voice search the force close you get should be the final crash you'll see. Have you got the Google Experience Launcher on your device already? What other features have you found? Does this work on any android version? is it compatible with nexus 4 ???? Hi @Mangesh, it sure is (I ran it on my Nexus 4), but there's no need to run these APKs anymore, as the new Google Search update is available in the Play Store and you can simply add the GEL APK to that to get a much smoother experience. Check out my ''official Google Search update'' article from yesterday - it has the links to the Google Search/GEL APKs. I've installed them both and GEL is working great, along with 'Ok Google' voice search and Google Now etc. Hi all, there's been a few strange bugs in these APKs. Part of it is due to the launcher being designed for the Nexus 5, not other devices. This is also why different users get different issues. To address some quickly though: make sure all three APKs are installed and follow the language change steps listed above. Some people are experiencing crashes when doing voice search from Google Now, others can't get voice search to work at all. It seems voice search is only supported in English but there's both the temporary fix mentioned in the article and permanent fix via root access. Supposedly the launcher will not be coming to every Nexus device, or every device at all, although voice search should be. I've had various force closes, freezes and non-responses, so this is definitely a temporary and fun fix, not a permanent app replacement. I'll let you know what happens when 4.4 arrives officially OTA. I keep getting "there is a problem parsing the package",what can I do? I installed Velvet and PreBuiltGmsCore but when I installed the launcher, the screen went black and all I could access was the notification shade. How can I get the launcher to work? anyways just wondering, should I uninstall PreBuiltGmsCore (Google Play Services 4.0) if I decided to uninstall the launcher? i can not install this app, whether this app does not support in android ics? FOUND A BUG. While this isn't a deal breaker by any means, I found that after installing the GEL on my Note 2, I used the built-in Favorites Widget to put my Favorite Contacts on one of my home screen and it came up blank. I could manually add people to it but the widget did not pull any Favorites from my Contacts. I'm guessing that this has more to do with the fact that the launcher was not installed as a system app (I'm not rooted on this phone). One other issue, not a bug, is that the icon size and arrangement makes my Note 2 feel like my old OG Droid. The icons are unusually large and the grid spacing is really spread out. The rest of the new GEL and other N5 apps has been spectacular. I'm really digging the Google Email app. Having ALL of my mail (Gmail, POP3, IMAP and Exchange) in one place is fantastic. It doesn't come with Exchange but several blogs have posted the download service that adds Exchange capability to the app. Since it follows the newer Gmail app layout, there's already familiarity on how emails will be handled. I downloaded it and it is really nice. But the voice search doesn't work. I'm from germany. Mohamed, I changed the language, the search is working, but the launcher don't open. Try to download to download to offline recognition, go settings > language & input > Voice Search > Offline speech regocnition, then download the language you want. Could this be installed on ICS? Have you tried changing the default language? I'm having a different issue, I installed everything but it doesn't respond when I say "OK Google"
HI Kris, i couldn't open the launcher, it says that Google Search stopped. But, it is working... this issue is just when i open the launcher, when i try to do a voice search or use the google now, it works perfectly. can you help me ? Good question Mahamed, the battery and memory optimizations that will come with KitKat will undoubtedly address this issue, but at the moment I'm not sure, especially since only the Moto X has the special language core for listening. I've only had it on my Nexus 4 for a few hours and the battery discharge seems normal to me. I'd suggest trying it out and if the battery consumption is bad just revert back to the old system. I have to say I do really like it though.